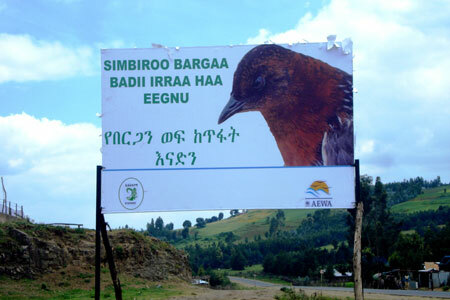 Bonn, 12 February 2015 - The White-winged Flufftail (Sarothrura ayresi) was the focus of an AEWA Small Grants Fund (SGF) supported project which was recently completed by the Ethiopian Wildlife and Natural History Society (EWNHS), in the Berga wetland. The latter is an Important Bird and Biodiversity Area (IBA) and site of critical importance for waterbirds - located in Ethiopia’s central highlands. The White-winged Flufftail is an elusive and little-known species thought to be undergoing a rapid decline. It was uplisted to Critically Endangered in 2013, and its numbers are currently estimated at fewer than 250 birds. 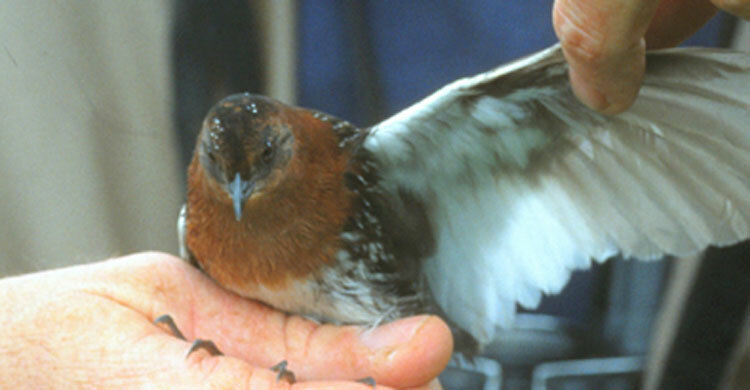 The species occurs in Ethiopia and South Africa (with isolated records also from Zambia and Zimbabwe); it is currently unknown whether the Flufftail migrates between these two countries. Ethiopia’s central highlands constitute the species’ only known breeding grounds. In the course of this EWNHS-run project, basic research on the status and migration routes of the Flufftail was carried out, awareness of the species’ importance and conservation needs was raised, and several habitat conservation as well as livelihood-related activities were carried out. The aim of these combined efforts was to alleviate the pressures on the species’ only known core breeding site, the Berga wetland. 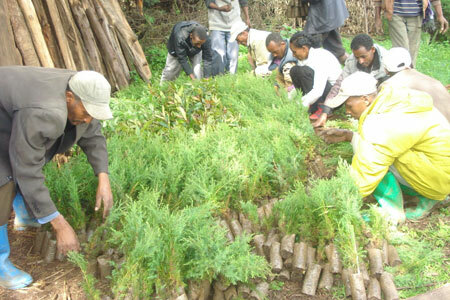 The activities were realized in close cooperation with the local community and a Site Support Group (SSG), an independent community-based organization with members drawn from relevant stakeholders, and which has been involved in activities aimed at the conservation of the White-winged Flufftail and its site, as well as income-generating activities aimed at improving the livelihood of its members and other community members. Four awareness-raising workshops which were organized for various groups of stakeholders, including government officials from relevant sectors (Agriculture Development, Environment and Land Administration, Culture and Tourism, Education etc. ), representatives of the Site Support Group and local farmers associations. Over 120 participants thus learned more about the species, its habitat and the threats it faces, as well as on the roles of the different stakeholders and the need for partnerships between EWNHS and local government departments in order to achieve the objectives of the project. One thousand copies of a Flufftail awareness-raising brochure were produced in Ethiopia’s two main languages, Oromo and Amharic. These were distributed to schools, relevant local government offices and the community. In addition, a large billboard bearing was set up in a central place to draw attention to the species’ conservation needs. Three hectares of land were fenced in the Berga wetland, to enable undisturbed breeding of the White-winged Flufftail in this area. In addition, patrols were carried out by members of the Site Support Group to limit access to the site during the Flufftail’s breeding season, in order to minimize trampling on nests. This activity is to be continued after the end of the AEWA SGF-funded project. Four kilometres of soil conservation structures, such as soil and stone bunds and cut-off drains, were set up on the Berga watershed to reduce soil erosion. Various species of trees, shrubs and grass were were also planted at different sites around Berga watershed as well as on the constructed soil conservation structures, in order to prevent land degradation. 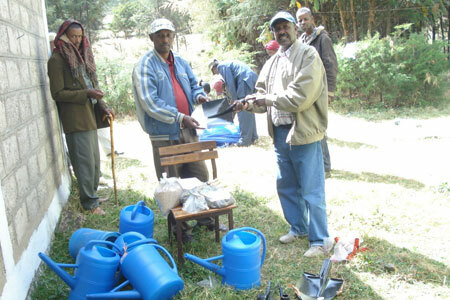 Some basic equipment, such as spades, watering cans, rubber boots and tree seedlings, was provided to two of the Site Support Group’s tree nurseries as well as a school nature club, for future use in rehabilitating degraded areas in the Berga wetland and patrolling the site. Potential Flufftail sites - close to the known ones Berga, Bilacha and Weserbi - were surveyed, but no birds sighted. The Berga, Bilacha and Weserbi sites were surveyed during and after the Flufftail’s breeding season, from late August until early November 2012, and three sightings of Flufftail at Berga wetlands were recorded, in late August and September, as well as in October. In addition, surveys were also carried out outside the species’ breeding period, in ten wetlands in South West Ethiopia, in the Bonga and Jima zones, in order to learn more about a possible migration of the White-winged Flufftail between Ethiopia and South Africa. This questions remains unanswered, however, as no birds were spotted. The activity was conducted as part of a collaboration between EWNHS, the South-African Middelpunt Wetland Trust, and researchers from BirdLife and South Africa. The UNEP/AEWA Secretariat congratulates the Ethiopian Wildlife and Natural History Society and its partners on the successful completion of this project. We hope that conservation efforts for the White-winged Flufftail will continue and indeed be stepped up to help save this rare species from extinction. For more information on the project please contact Mr Geremew Gebreselassie, Programme Officer at EWNHS at ggselassie@ewnhs.org.et. The AEWA Small Grants Fund became operational in 2010 and has since benefitted eleven conservation projects from 11 African countries with funds amounting to over EUR 200,000. The next call for proposals will be launched in 2015. For more information on the AEWA Small Grants Fund please visit the AEWA website. 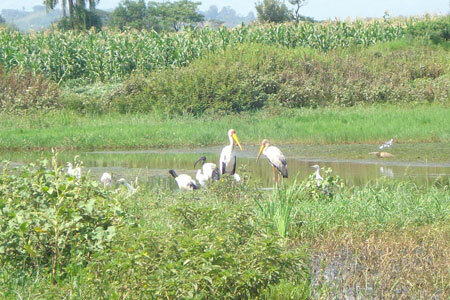 The EWNHS, the BirdLife Partner in Ethiopia, is the oldest and one of the country’s most prominent conservation NGOs. Since 1966, it has been promoting the wise use and conservation of biodiversity, natural resources and environment. For more information, please visit the EWNHS website.